Welcome to Bréhonnet, you will enjoy the calm of the countryside 4 km from the sea. Living kitchen of 30 m² (TV, 2 armchairs, a good quality sofa bed in extra bed, fully equipped kitchen, ..), a bathroom with washing machine, a toilet, a room of 12 m² (bed 160x200). Outside: garden furniture, parasol, barbecue, garden shed. The cottage is attached to another similar cottage. Outside, the houses are separated by a stone wall surmounted by a wooden palisade extended by a hedge. The environment is very quiet, the cottage is not overlooked. The cottage is located in the countryside in a hamlet of 4 houses. Nearby, a dairy farm and a small market gardening in organic farming. All shops and services in Audierne 3 km. The charges (water, gas) are included in the price, except the consumption of electricity beyond 5 kwh / day (0,15 € / kwh). The cottage is very well insulated and equipped with a solar water heater to offer a low energy lodging. The bed is made on arrival. For the use of the sofa bed in the living room, it is requested an additional 10 €. In tourist season (April to October), bookings are from Saturday to Saturday. Nevertheless an arrival on Sunday is possible. Out of season (November to March), other days of arrival and departure are possible, don't hesitate to contact me for any question on this subject. I stayed here early September 2018.The gite is in the middle of a working farm well off the road.There is no noise. It is very well appointed and has everything needed . The owner Ronan is still learning English but doing quite well .His wife speaks English. The surrounding country is wonderful with spectacular coastline to the north and wide sandy beaches to the south. Audierne is a pleasant fishing port nearby and the area is well served with supermarkets . If you are seeking a quiet relaxing holiday this is the place . 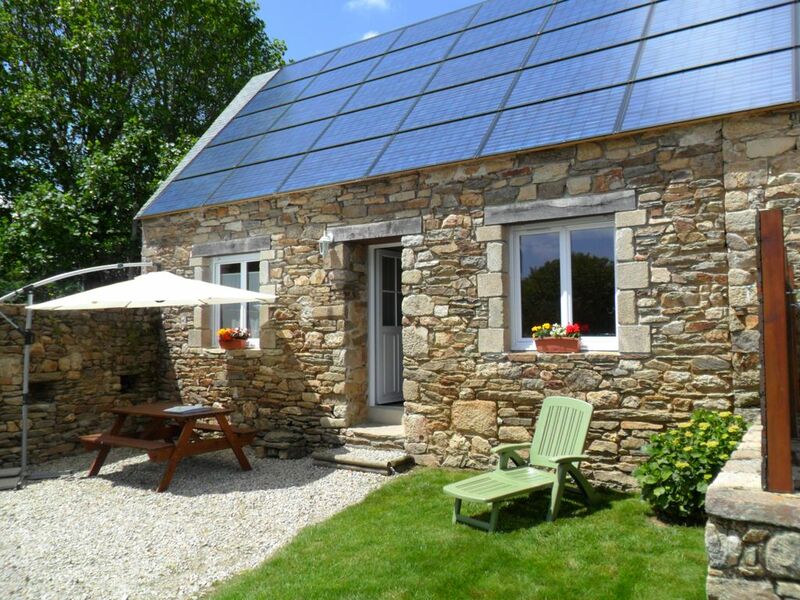 A beautifully appointed gite,peaceful farm site. lf you are looking for a peaceful, well appointed holiday cottage this will be the answer. Beautifully clean, well equipped gite, near to supermarket and boulangerie. Very friendly owners...wife speaks excellent English. You can laze on the site or visit the many wonderful beaches or coastal footpaths nearby. There are also many lovely old medieval towns close by. Excellent sea food resturants and creperies nearby...also make sure you try the local cider. lf its peace and tranquility surrounded by natural beauty you are after, this is the one! couple very charming, very interested in the local culture. "A lovely quiet location in beautiful countryside. Good walks and interesting places to visit." "La location tres calme et sympa. Idealement pour les familles." gîte très bien équipé et calme. Central pour visiter le cap sizun. Charmant gite au calme en pleine campagne, point de départ idéal pour les randonnées sur les sentiers et le littoral du Cap Sizun. Pointe du Raz et embarcadère pour l'île de Sein à proximité. Accueil chaleureux par le propriétaire. A Quimper, take the direction Audierne (when it comes to Lorient on the expressway is the last exit Quimper west). Arriving in Audierne, take direction 'Pointe du Raz.' At the roundabout after the Leclerc supermarket, take direction Goulien. Browse 2 km, turn left Goulien direction. Browse again about 2 km, turn left at sign 'Bréhonnet'. Browse 600 m, you're there.